I started this series last year, where I do one Halloween blog post a week for all of October. So welcome to my favorite time of year, Spooky Season! Here is my final Halloween post for this year, I wanted to put it out a little earlier than Saturday this week, so here we go…… Quick and Easy Halloween Costumes! I am in no way athletic at all, but I wanted a costume that was going to be comfortable and easy to put together with what most women have in their closets. 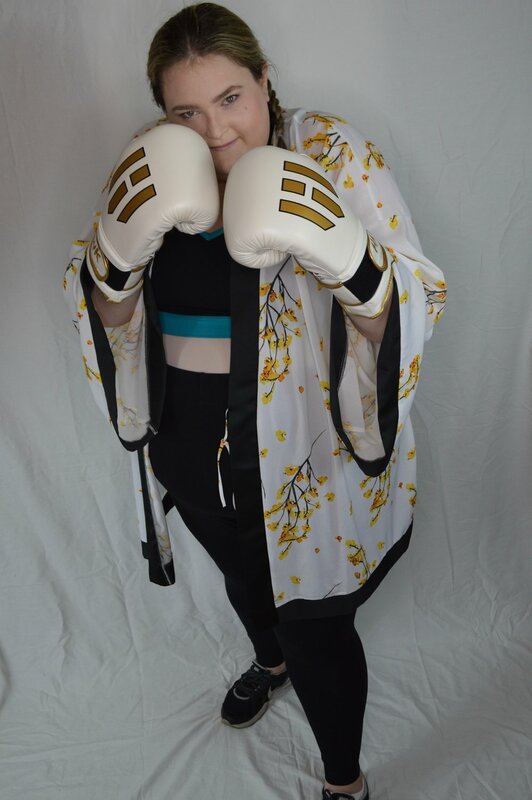 My boxer costume consists of the athletic wear most of us already have; a sports bra, leggings, sneakers, and a robe. For the boxers hair I did pig tail braids because they keep the hair off the face, and it’s all the ability I have in doing hair. For my make up I kept it light with a little blush and mascara, and if you are feeling adventurous try adding a black eye. I added some boxing gloves from Amazon, but you could probably find some at a thrift store or borrow them from a friend. If you wanted to do it a little easier pick up some colored athletic wrap at target, or another drug store, and wrap it around your hands and wrist. This costume is so easy! A lot of women have a chambray, or denim shirt in their closet, or could invest in one for Halloween and then wear it with multiple outfits the rest of fall and winter. To finish off this costume add a pair of jeans and black sneakers or boots. Rosie wore a red bandana on her head, so I got one on Amazon, but they can be found in many stores like; Target, Walmart, and Michaels. Adding the bandana over a simple up do or braid crown pulls together her look. Finish off her beauty look with a bold brow and some rosy cheeks. This costume was the most embarrassing for me to shoot. 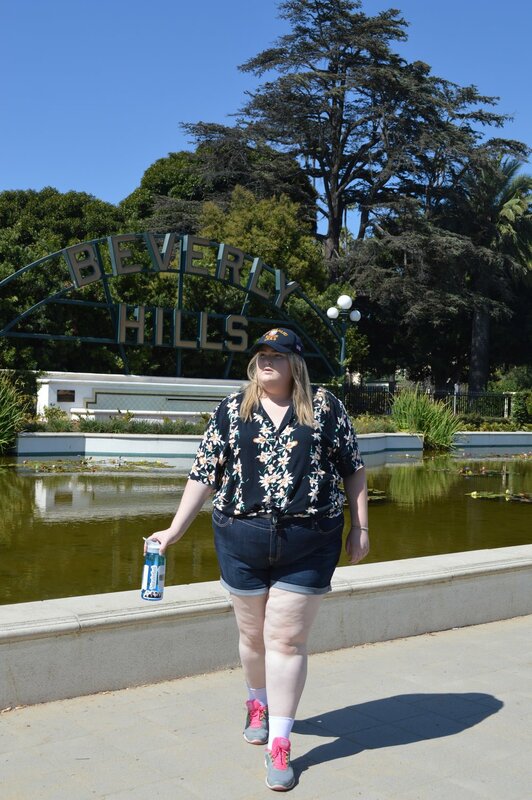 I was walking around Beverly Hills essentially poking fun at the fact that all the people around me were tourists. 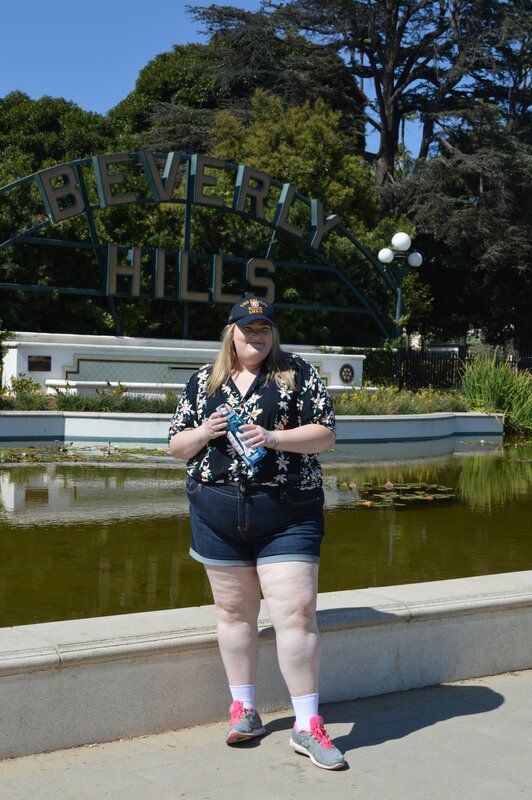 While most tourists in Los Angeles don’t actually dress like this anymore, I think that it was a funny and easy costume to put together. For the costume itself I got a Hawaiian shirt, which you can probably steal from your dad’s closet or buy one at the thrift shop for really cheap, I paired it with a pair of denim shorts, but a pair of khaki shorts would work as well. I accessorized with some white ankle socks and athletic shoes, a base ball cap, and a water bottle (this can also be useful at a Halloween party to stay hydrated). This year’s Halloween costumes were so fun to do! I can’t wait for next year, I want to go bigger and better every year. In the comments below post what you want to see; more special effects make up looks, more glamorous looks, more kid friendly looks, more party looks…. I want to hear what you want to see me create for next year’s twelve costumes.